New state data show that 97 percent of schools participating in a voluntary testing program had at least one water source with levels of lead above one part per billion. Meanwhile, a bill that would have set new limits on lead in school drinking water appears likely to die in Olympia. 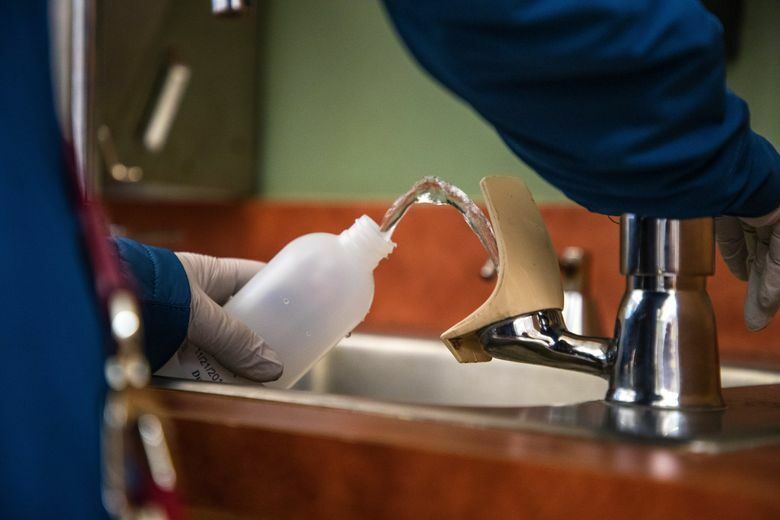 A report shows for the first time just how much lead is in the drinking water in some Washington state schools — but a a legislative proposal to limit students’ exposure to the toxin appears doomed. Since early 2018, the Washington Department of Health has tested more than 8,600 water fixtures — everything from drinking fountains to bottle fillers, classroom sinks and kitchen faucets — at 199 schools and preschools that volunteered to participate. 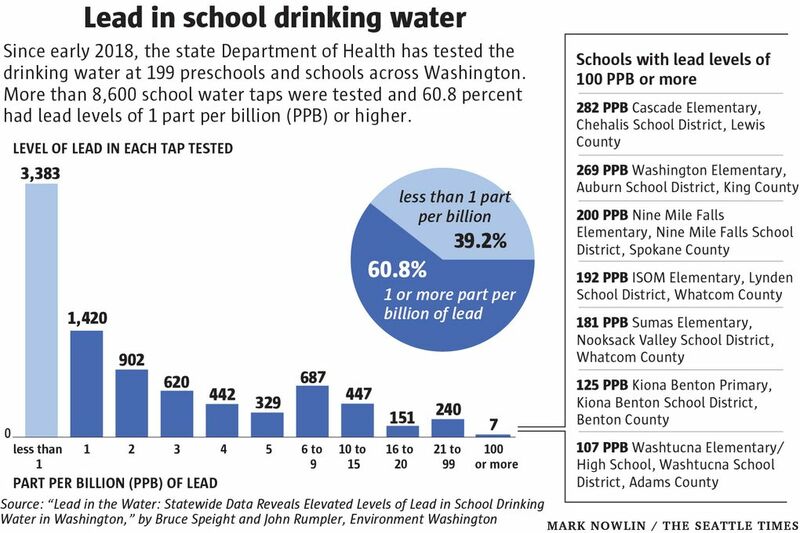 The results of those tests, analyzed in a new report from Environment Washington, show that 97 percent of schools had at least one water source with levels of lead above one part per billion. About 61 percent of the total fixtures tested at or above one part per billion, a threshold recommended by the American Academy of Pediatrics. About 400 taps, or 5 percent of the total tested, failed the federal threshold of 15 parts per billion. Commonly found in old paint and plumbing, lead is poisonous to everyone, but it poses a greater risk to children, whose bodies more readily absorb the heavy metal. Exposure to lead can cause learning disabilities and behavioral problems. In elevated cases, lead can also damage kidneys, blood and the nervous system. The report analyzed test results posted to the state department’s website as of October and represented about 8 percent schools throughout Washington. In Washington, school districts currently don’t have to test their drinking water for lead or any other contaminant. House Bill 1860, filed in the Legislature earlier this month, would mandate such tests for the first time and require districts to notify parents if any water source at their children’s school had more than one part per billion of lead. The measure also would trigger an immediate set of fixes to water sources testing above five parts per billion. The House education committee, however, hadn’t even held a hearing on HB 1860 as of Wednesday, meaning the bill will likely die in committee before a Friday deadline to pass legislation on to the full chamber for consideration. “It will still be alive next year,” House education committee chair Rep. Sharon Tomiko Santos, D-Seattle, said of HB 1860. State Rep. Gerry Pollet, D-Seattle, filed HB 1860 on Feb. 1, the same day The Seattle Times reported on the persistence of lead in the water at Seattle Public Schools. Santos said she didn’t hear about Pollet’s bill until after she had already scheduled the last week of committee hearings in advance of the Feb. 22 deadline. While she had no specific comments about HB 1860, Santos noted she has spent years trying to advance legislation that would address Washington’s teacher shortage. “Legislation often gets introduced, and it could be very critically important, and it takes multiple years to even get heard,” she said. In 2009, the state Board of Health attempted to regulate how much lead was acceptable in school drinking water. Lawmakers, however, never funded that mandate, rendering it unenforceable. But starting last year, the state Department of Health invited schools — especially older campuses and those that enroll younger children — to participate in a voluntary lead-testing program. The tests included every source of drinking water in participating schools as well as fixtures that could be used for cooking, according to a department spokeswoman. In Seattle, the state’s largest school district, four elementary schools participated in the voluntary testing program: Catherine Blaine, Daniel Bagley, Hawthorne and Maple. The results from 26 of 92 fixtures tested at those schools would have triggered automatic remediation under HB 1860’s threshold of five parts per billion. At Hawthorne Elementary in Southeast Seattle — an area Santos represents — the state’s tests revealed at least one water source even failed the federal government’s less-strict limit of 15 parts per billion. At 269 parts per billion, the second-highest level of lead detected across the state was at Washington Elementary in the Auburn school district. District spokeswoman Vicki Alonzo said, of the 405 fixtures tested at eight sites, a total of 13 had levels of lead above the federal threshold. “We replaced all 13,” she said.